Toro Rosso has become the second team to reveal its 2019 contender, the STR14. In the following Q&As, the team reveals that, as previously reported, the Faenza outfit will enmjoy significantly more technical cooperation with its 'sister' team this year, including sharing the entire rear end, as both teams now use Honda power. Other than the rear end, Toro Rosso will also benefit from it's 'sister's gearbox, electronics, hydraulic components and some front suspension parts. At the same time, Honda insists there will be total parity as far as thetwo teams are concerned, even though it has already been admitted that Toro Rosso will continue to be the 'test bench' in terms of upgrades. Franz Tost (Team Principal): I could summarize them in three main points: The team, the car, and the drivers. The aim is to always improve in order to compete at the highest possible level and this winter we have worked intensively to bring a few organizational changes, which we hope will help smooth a few issues we experienced in the past. We have analysed all the internal procedures in order to optimize our strengths and minimize our weaknesses. Compared to other teams, Toro Rosso count on a smaller number of people, but the synergies with Red Bull Technology for the non-listed parts, now that Aston Martin Red Bull Racing will also be equipped with the Honda Engine, will leave more time for our technical working groups to focus more on the details. Attention to detail makes the difference and this translates to more performance. Now that AMRBR will be equipped with the same engine, Honda, there will be the possibility to realize the synergies project which Red Bull has always striven for. Can you explain in further detail what the synergies project refers to and which advantages you see? FT: Mateschitz decided to buy our team with the idea to educate young drivers from the Red Bull Driver pool and to use one technology centre to supply expertise and parts for two teams. And actually, this is the philosophy we followed until 2010 when the other competitors in the Championship voted for a rule change, which put an end to the project. Following this decision, Scuderia Toro Rosso was forced to create the necessary infrastructures to become a manufacturer team, capable of designing all parts in house. We had to hire many more people and, from around 100 employees at the time, we can now count approximately 400 people, split between the factories in Faenza and Bicester (300/100). The Synergies project will allow us to aim for a step in performance without increasing the number of people; we will buy some parts and have more minds and hands to design and produce all the others. Does this mean that Red Bull Technology will provide Scuderia Toro Rosso with exactly the same specifications used from Aston Martin Red Bull Racing this season? FT: Components relative to the power unit will be the same specification as Aston Martin Red Bull Racing, to be used within the regulations. Most of the remaining parts we receive from Red Bull Technology will be last year's specifications. 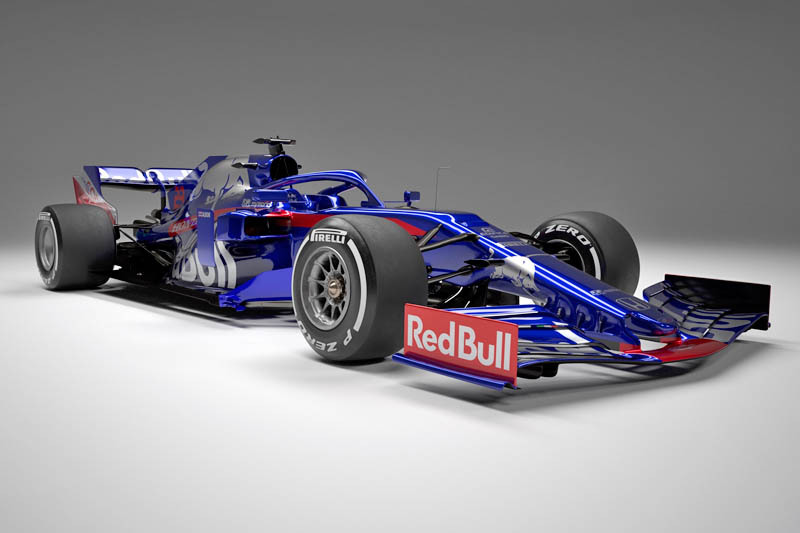 Scuderia Toro Rosso, being a smaller team, could not follow the fast development and production process a bigger team can afford, especially considering that the release of the technical drawing could, for whatever reason, be delayed or delivered last minute. FT: I do. We have very good technical people to follow the in-house design, and the reliability of last year's synergy project parts will put us in a more favourable situation to develop quicker during the season. An important element of the car is the engine. How would you assess the progress Honda made during 2018 and what do you expect from them this year? FT: It's been a great decision to move to Honda last year and, despite it being year one of what we hope will turn out to be a very long relationship, the cooperation with them has been amazing. If there's something you can't buy in Formula 1, it's time, and the step forward they made in just one year reflects the enormous commitment they put in the project with us. The confidence that also Aston Martin Red Bull Racing has agreed to be supplied by them will give an additional boost to improve even further. And now the drivers: we will have Daniil Kvyat back in the team and the young Alex Albon making the step to Formula 1. Tell us why you think Daniil deserved another chance, and do you think Alex is a quick learner and can adapt quickly to an F1 car to deliver good results? FT: I always say that a young driver needs two to three years to understand and deliver in the complicated world of F1, but Daniil showed his natural speed from the very beginning. When the contingency required his move to Red Bull Racing, it seemed that he could be ready for the challenge. He showed some very good performances but to perform under pressure is always a challenge, now we can say with hindsight it was just too early. He had to live through a difficult time when he joined us again in 2016 – it was psychologically tough, but no one has ever doubted his driving skills. I strongly believe he deserves another chance in Formula 1 and I feel the best is yet to come from his side. Having had time to mature as a person away from the races will help him show his undeniable capabilities on track, as well as supporting Alex in his development as a young driver. Alex will have a lot to learn, like any newcomer in Formula 1, but he certainly proved himself in the lower categories like European Formula 3, GP3 and especially in Formula 2, where he was able to win races. In the second half of last year's F2 Championship, he impressed with a lot of overtaking manoeuvres and that's what convinced us he is the right driver to get on board. With Daniil on the other side of the garage, he has an F1 experienced driver with whom he will be learning a lot from, along with the support of the team around him. Scuderia Toro Rosso is very much looking forward to 2019, as with Daniil and Alex we have two young and competitive drivers. Having said all this, what are your expectations for 2019? FT: In regards to our performance, as is always the case before the start of a season, it's too early to say and we don't want to set a specific target – at least not now. All things considered, the quality of the synergies with Red Bull Technology, the belief in our very high level of in-house technical knowledge, the impressive development trajectory Honda has shown so far, and the couple of strong young drivers we have available make me feel confident we will put ourselves in a strong midfield position in the Championship. How did Toro Rosso approach the new aero regulations for 2019? Jody Egginton (Deputy Technical Director): One of the intended purposes of the 2019 regulation changes was to reduce the amount of outwash generated, which leaves us with the challenge of reconstructing the required flow structures to recover the lost load within the scope of the new regulations. Although the front wing width has been increased, we've lost the winglets and the elements which were on the outboard portion of the main plane and the endplate itself is simplified. Together with the simplification of the front brake ducts, the opportunities for generating the required flow structures and positioning them where you want are different, and require you to recover the size and trajectory of the front wheel wakes and flow structures by identifying key areas for aerodynamic development and exploiting these to the maximum. The aero and design groups have worked hard to achieve this, whilst in parallel also focusing on aspects of the aero development process, focusing on developing a car concept which permits sustainable and regular aero development without the need for major architectural changes. This approach will be required to aerodynamically develop the key areas of the car quickly as a rolling development in season, as we expect to see a rapid development phase early on. Has the design and development process changed from last year's car to the STR14? If so, what's different? JE: A number of changes have been put in place regarding how we develop the 2019 car, including the approach to how we develop the car aerodynamically. This was a topic which had been under review for a while and whilst there is never an ideal time for such a change, based on what we had learned in 2018 it was decided that now was the time to introduce these changes. Although the timescale for some of these changes was tight, and in the short term these changes have generated some extra work, the development rate of the 2019 car is now strong and responding well to the aero developments being evaluated in CFD and the wind tunnel. Regarding development targets, we have developed a number of metrics which allow specific areas of the car's aerodynamic performance to be tracked and evaluated. This will allow our aero updates to be better targeted against specific identified needs. Ultimately, it's the rate at which we're developing and how quickly we can get these updates onto the car which remains the primary focus. In addition, of equal importance is arriving with updates which bring load to the right areas of the map and which correlate well. In some respects, this is different to the approach of focusing on aero packages, however by adopting a 'rolling' development - especially following a regulation change - there is potential for faster reaction and a more straightforward approach to correlation. There's a lot of talk about "synergies" with Toro Rosso receiving parts from Red Bull Technology, how has this impacted the STR14 Design? JE: Nothing has changed in terms of the design process of laying the car out, we just have a few less variables to play with. However, within the framework of a fixed amount of available resource, this can provide an opportunity as it allows more focus on other areas of the car concept which in turn can bring performance. In our case, it has allowed increased focus on the design of the chassis structure, packaging of the brake ducts and front suspension, and the integration of the fuel and cooling systems into the chassis. All of this results in packaging and mass reduction benefits and provides the team with more potential for aero development. The chassis itself, as per regulations, is a complete Toro Rosso design and IP as is the front outboard suspension, along with all aspects of the cooling systems, power unit installation & steering column. The 'rear end' has been provided by Red Bull Technology and the key change for Toro Rosso, being that we are taking a gearbox casing and rear suspension although many of the internals of the gearbox are similar to parts we have used in the past. Having committed to parts supply from Red Bull Technology, a lot of effort has to be put to integrate everything as well as possible and of course, this remains under the sole control of Toro Rosso. In that respect, we're excited to join Toro Rosso and Red Bull Technology. Synergy is a concept we as a team have embraced, it has several positives which gives us the ability to refocus our design effort on other areas and resources that come with it, whilst receiving parts which are proven trackside. Check out our STR14 gallery, here. "Good livery, if not the best!"